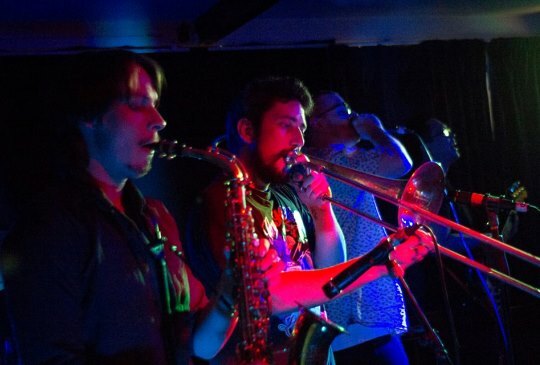 Since 2011, hip-hop/brass band Shoutin’ Preachin’ have been making noise on the Auckland scene with their unique blend of socially conscious rap, New Orleans-style horns and hard grooving, boom-bap influenced bass and drums. Early last year, the group released their debut EP, New Low Humans, on the Sound Recordings Label. The title track has since spent significant time in the bFM playlist and top 10, it also tracked well on the music charts at theaudience.co.nz. Playing regularly at local venues and sharing the stage with acts such as Randa, Tourettes, World Champion Beatboxer King Homeboy, Harvey Knows A Killer and American act King Missile, Shoutin’ Preachin’ have recently taken their live show further afield with a brief tour and performances at this year’s TMS presents Woodcock III, Monster Valley’s The Experiment and Chronophonium festivals. Currently the band is working on a follow-up album. With this in mind they are looking forward to further touring and taking their new material to a wider audience over Summer.